Sampling oscilloscoop van PicoTech de Picoscope 9000 serie met een snelheid tot 20Ghz! Small enough to be applied directly to the device under test, or close by, Pico Sampling Oscilloscopes are extremely high-performance and cost-effective measuring instruments for high-speed digital, communications, RF and microwave applications. Sampling Oscilloscopes achieve better bandwidth and timing resolution than their traditional oscilloscope counterparts. They do this by sampling the signal more slowly, but right at the input connector. A sampling oscilloscope builds a waveform display as the input signal repeats and is not suited to single-shot capture applications. The true power of a sampling oscilloscope is realised when the signals to be measured have a repeating or cyclic pattern, or a steady data rate. Sampling Oscilloscopes typically have high resolution, an input impedance of 50 Ω and a single gain range. Active probes and external attenuators are added to achieve high impedance measurement and wider dynamic range. With the fastest available sampling rate, Pico sampled waveforms and persistence displays are captured three times faster than competing sampling oscilloscopes, which are often bulky and three times the price. With their powerful and unique trigger, hold-off and acquisition features, Pico samplers can lock to repeating signal features with minimal jitter. All models have trigger pre-scalers (frequency dividers) to allow triggering at up to 14 GHz, while the comprehensive acquisition modes, trigger modes and timebase ranges can display frequency below 100 Hz through to an effective sampling rate of 15 TS/s! Some Pico models include a clock recovery input. An external divider feeds a serial data stream to the sampler input and the clock recovery module, which then regenerates a clock to define data transitions and valid data. Using clock recovery, Pico Sampling Oscilloscopes can display eye diagrams and apply standard communications masks using only a received data stream. Pico's PicoSampleTM software for Windows is included, presenting a user-configurable, intuitive interface on Windows XP, 7 or 8 platforms and all supported display resolutions. Comprehensive controls are presented in easy-access menus either side of the trace display area. You can select the controls you need, and hide the rest to reduce clutter. Multiple trace windows support colour or density profiling, vertical or horizontal histograms and 138 pre-defined trace, eye and statistical measurements; up to ten tabulated simultaneously. 167 standard serial data communications masks are included with user margin, editing and custom mask compilation. 61 trace math functions can be applied using buttons or a formula editor. A fast pulse launched into a transmission line or network propagates according to the losses and mismatches of that line. A sampling oscilloscope can resolve amplitudes and delays and thus analyse the network similarly to a Scalar or Vector Network Analyser. The display of distance to, or length of, a mismatch allows efficient and intuitive fault location. The PicoScope 9211 and 9231 include the fast edge generator and accessories required for TDR / TDT analysis. The software measures voltage, impedance, conductance, dB and distance and includes a calibration function. 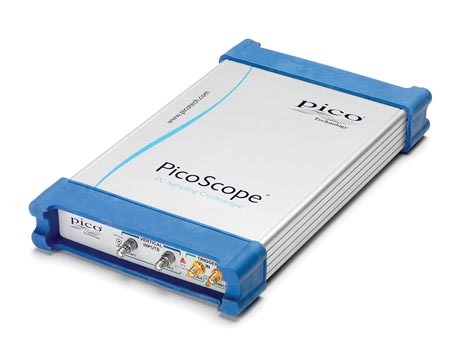 serial data and comms waveform measurement and mask testing can be extended into optical fibre systems using Pico's 2.7 Gb/s Optical to Electrical converter and the Clock Recovery module. The PicoScope 9221A and 9231A integrate these with a PRBS pattern trigger. SMA Pulse Correction Filters are available. 9000 series of PC-based Samplers, first the 9200 at 12 GHz and now the 9300 at 20 GHz. Users of the 9200 series will find the PicoSample 3 software familiar, with its built-in metrology experience and design expertise, as well as benefitting from the improvements in the new release. There is a rich library of video, document and support material behind the links below. Information based on the 9200 product family applies equally to the 9300 and PicoSample 3. 2 mV/div to 500 mV/div. ±0.2% of Delta Time Interval ±15 ps at a temperature within ±3 °C of horizontal calibration temperature. ±15 ps or ±5% of Delta Time Interval ±5 ps, whichever is smaller at a temperature within ±3 °C of horizontal calibration temperature. Automatically characterises NRZ and RZ eye patterns. Measurements are based on statistical analysis of the waveform. Acquired signals are tested for fit outside areas defined by up to eight polygons. Standard or user–defined masks can be selected. 10 Mb/s to 8 Gb/s with pattern length from 7 to 65,535 max. DC to 8 GHz typical. 10% to 90% calculated from Tr - 0.48 / BW: 60 ps max. USB 1.1 compliant port minimum. USB 2.0 compliant port recommended. The SDK allows you to control the scope from your own program. The software can act as an ActiveX COM server, allowing any program to send commands to it using a standard Windows protocol. This is ideal for production–test environments where multiple scopes need to be controlled from a single PC, or where automated tests need to be run. The SDK contains full documentation and example code for various programming languages.